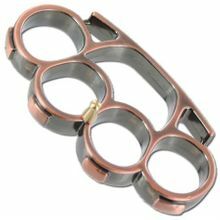 Good quality copper belt buckle knuckle. 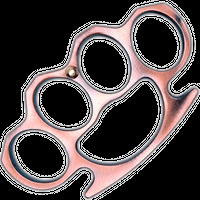 The first one pictures is the Iron Fist Style with extra embellishment on each knuckle edge. The second one is the traditional style of knuckle. Both weigh about 5 oz. and have a nice copper finish. Both have a buckle stud for use as a belt buckle. The stun screws in the pre-tapped hole if you want to use a buckle. For collectors or display, the stun can be left off.